I love to eat, but I’m also a total cheapskate about food. If the question is between eating rice and beans vs. not going to that concert, I’ll always choose the concert. My signature dish is some version of a stew — black bean sweet potato chili, for example — that I can freeze and portion out over the meals. When I spent a semester abroad in Oxford, the program gave us biweekly food stipends. I spent my entire stipend at pubs the first weekend and learned to survive on grilled cheese sandwiches and 17 pence tomato soup. I’d walk the mile back from Tesco with 40 pounds of cans in my pack and a bruise where my back met the bag. I’ll also admit to some food hoarding tendencies — I just feel more comfortable with a fully stocked cupboard. Growing up in Pennsylvania, we regularly had blizzards or hurricanes that left us without power for days at a time. But with canned soup and a gas stove, there was always an easy to prepare hot meal. Hard evidence of my soup stashing ways at Oxford. I’ve shifted away from canned soup to my own creations these days, but I’m always looking for the best bargain. I live in San Francisco without a car. I have four main grocery options: Safeway (0.9 miles away), Trader Joe’s (1.2 miles away), Costco (1.2 miles away), and Casa Lucas, a small local grocery that’s 0.4 miles away. Occasionally, I can convince a car-driving-non-Costco membership-having friend to go with me and we can split the receipt using Venmo (S.F. friends with cars, hit me up!). 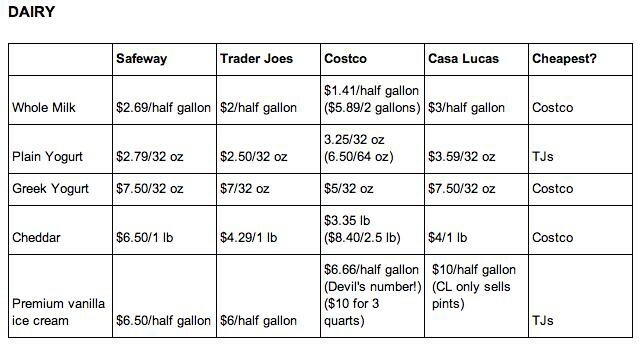 Costco was the cheapest for three out of the five items, but you need to consider volume and your eating patterns. I only shop for my own (considerable) appetite, so buying two gallons of milk at a time isn’t worth it (unless I split it with someone. S.F. friends who drink whole milk, hit me up!) (it tastes a lot better in the breakfast tea I got addicted to in Oxford). Because I’m such a voracious eater that 32 ounces of Greek yogurt doesn’t faze me, I’ll buy yogurt and hard cheese at Costco but pick up milk at the corner store and ice cream at Walgreens (surprisingly cheap there). Costco wins two out of four, and I definitely think I’ll continue buying meat there. I currently have about 15 pounds of chicken breasts, 20 sausages, and 10 pounds of bison (great for chili) in the freezer, and it’s easy to thaw as I go. Casa Lucas is the overall winner here, which is great news because I’d rather get fresh produce every few days nearby than do big trips at another grocery and let the food rot (although sometimes I like to “race” a huge carton of baby spinach before it goes bad, i.e. blanched with lemon or in scrambled eggs with lots of cheddar). There are another dozen Mexican grocery stores in the neighborhood with ridiculous flash sales that I scope out when I’m walking around. A two-by-one-foot box of bananas was $1 the other week (how does that make sense?). A box of organic spinach and baby kale almost too big for the fridge was $2. Pretty sure this food “fell out of the back of a truck” but it tastes fine to me. No surprise here: Costco triumphs for dry goods. I’ve been an enthusiastic Kashi muncher for the last 10 years and I usually get two of Costco’s 51 ouncers at a time. (Hit me up Kashi I will gladly be your spokeswoman!) 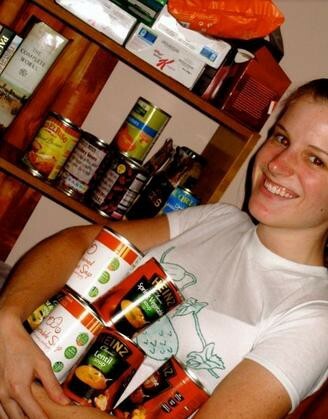 If you regularly make soups and stews, I recommend getting the flats of canned beans and tomatoes. The savings aren’t huge on a can by can basis, but it’s nice knowing that I can make an impromptu chili whenever I want. I learned a lot from this experiment. The problem with “family-size” stores like Costco is price myopia. You lose sense of the average cost of something, and you assume you’re getting a great deal. 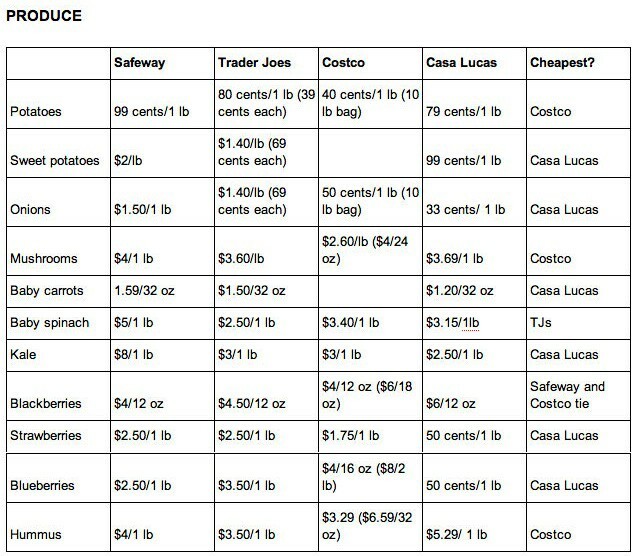 I was surprised to see how much cheaper produce is on the whole at Casa Lucas. There’s a lot that I’ll continue to buy at Costco: meat I can freeze, dairy I can eat quickly enough, and dry goods (IMPORTANT COCOA ALERT: Costco sells a six-pack of Ghiradelli brownies for $9!). Great to have around in case of emergencies like break-ups or general weekday despair. If I had a car and wanted to make a quick one-stop grocery trip, I’d probably choose Trader Joe’s. It had good deals across the board, and especially in uncharted but important categories like liquor and frozen food. It sells produce by the item, which is weird but good if you’re into huge apples and sweet potatoes. Safeway seemed to be the under-performer here, with one exception in a big sale on chicken breasts. Also, their produce was the worst quality of the four, at least at the store near me. 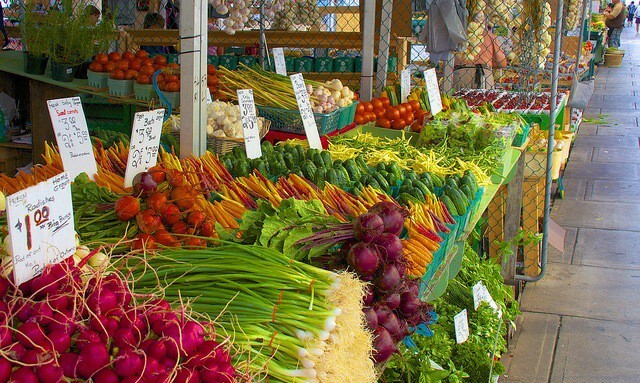 How do these prices compare with the grocery stores near you?